It can be tempting to avoid home maintenance in the summer when there are so many other things you’d rather be doing, like lounging by the pool, sending the kids off to summer camp or enjoying dinner al fresco. 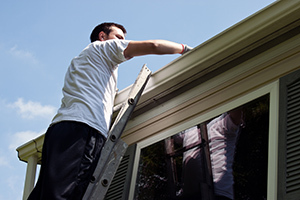 The long summer days, however, are ideal for clearing out gutters or adding gutter guards, replacing cracked or damaged porch awnings, or taking a painting job off your to-do list. Now you can do all of those things –– and still enjoy your free time –– by investing in the home maintenance services that are available in Durham, NC from Gerald Jones. You don’t have to take our word for it though; check out our testimonials page to read what previous customers say about our Durham contractors and their home maintenance projects. Our siding experts can also add trim and shutters to spruce up your home’s exterior. If you’ve unrolled your awning, and have noticed some damage from the winter ice storms, Gerald Jones is happy to help you with that as well. Offering retractable, as well as window and door coverings, our awnings are ideal for keeping the sun’s rays out and cooler temperatures in for your home, sunroom or patio. Since you’ve successfully side-stepped painting your home by installing siding, climb up on your ladder and check out those gutters. Are they clear for any summer rain storms? After you clean them out, keep them that way by asking the Durham contractors at Gerald Jones to install gutter guards, thereby cutting down your chances of debris getting trapped and flooding your gutters. Knock some tasks off your Durham summer home maintenance list by working with the home experts at Gerald Jones. Call our Durham contractors today at 919.286.1700 to get started! This entry was written by geraldjones, posted on May 1, 2015 at 3:59 pm, filed under Uncategorized. Bookmark the permalink. Follow any comments here with the RSS feed for this post. Both comments and trackbacks are currently closed.